In the last laps of the Hungarian GP Bottas felt the need for speed, but his defensive driving was busy writing cheques his car couldn’t cash. Instead of hitting the brakes and letting Sebastian Vettel fly right by, he locked up and damaged his front wing. Then when battling with Daniel Ricciardo, he put himself right in the danger zone and crashed into him, too. He’d helped Lewis Hamilton to victory in the process, though, and Toto Wolff praised him for being the perfect wingman. On hearing his remarks, Bottas lost that lovin’ feelin’ and said being called a wingman “hurt”, and although the whole thing was quickly over, it’s not something anyone will forget in a hurry. 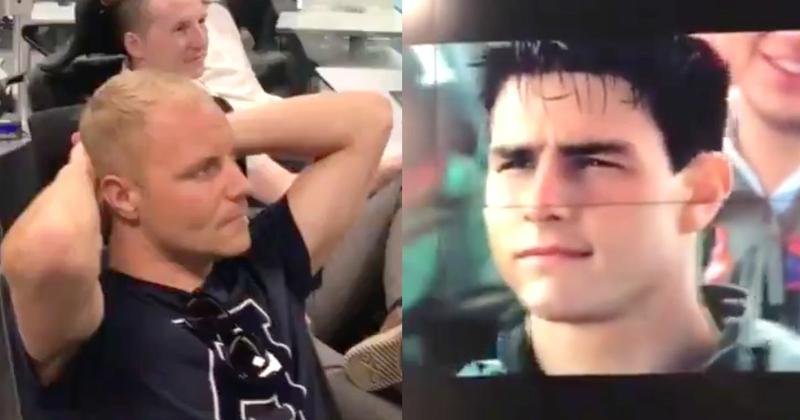 But instead of trying to sweep it under the rug, Bottas and Mercedes have embraced the tag and inverted the whole controversy (if you can even call it that) with this video on Twitter, playing up to the famously-cheesy wingman scene from Top Gun. The only question is this: is Bottas Iceman or Maverick?